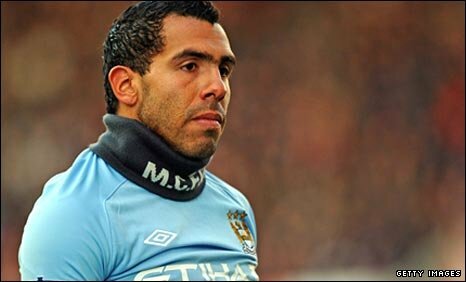 Manchester City captain Carlos Tevez has submitted a written transfer request, which the club has rejected. The 26-year-old Argentina striker is said to be homesick after four years in England. "The club remains disappointed by this situation and particularly with the actions of Carlos' representative," said a Manchester City statement. Tevez was suspended on Saturday as City won at West Ham to move level on points with Premier League leaders Arsenal. He had an angry exchange with manager Roberto Mancini when substituted in the closing moments of his last match against Bolton on 4 December. City say that Tevez and his agent, Kia Joorabchian, have been pushing to renegotiate the player's five-year contract in recent months. The statement continued: "Roberto Mancini and all at the club have shown, and will continue to show, sensitivity to Carlos' personal circumstances including the issue of his family being based overseas. "Indeed following his suspension as a result of the game against Bolton, Carlos requested, and was given, special dispensation by the manager to take leave overseas. "The written transfer request is in stark contrast to Carlos' stated position in both public and club contexts. "Significantly, over recent months, the club has also received numerous requests from Carlos' representative to renegotiate and improve his playing contract as well as more recently a request to extend that contract by another year. "However, in line with the club's policy of not negotiating playing contracts mid-season this has not been granted. Carlos' current five-year contract has three-and-a-half years to run and he is the highest paid player at Manchester City Football Club. "This is both an unfortunate and unwelcome distraction and the club will remain focused on the games ahead in what is turning out to be a very promising season. The door remains open for Carlos to be selected to play." Tevez joined Manchester City from rivals Manchester United last year after a two-year spell with Sir Alex Ferguson's side that saw him win two Premier League titles, the Champions League, the Fifa Club World Cup and the Carling Cup. He then joined fierce rivals City in July 2009, and was a key member of the side as they just missed out on Champions League qualification by finishing fifth last season. BBC Radio 5 live football correspondent Ian Dennis said: "The striker is believed to be homesick and over the last couple of months there have been suggestions he's considering quitting football altogether. "In a recent television interview he said he was tired of football and tired of people who work in football." Tevez left South America for England in 2006 to join West Ham, along with fellow Argentine Javier Mascherano, and scored the goal at Manchester United on the final day of the season that kept the Londoners in the Premier League. However, the pair's third-party contract ownership by Joorabchian's company, Media Sports Investments, ultimately led to West Ham having to pay the relegated Sheffield United £20m in compensation. City have had a number of problems with their strikers this season and have been heavily reliant on Tevez, who has scored 10 of their 23 Premier League goals. Emmanuel Adebayor has struggled to hold down a regular place in the starting XI, while summer signing Mario Balotelli has spent spells on the sidelines through injury and suspension.